Small Scale: Sheet: 22"x32", Design: 19"x298"; each scale is approx. 2"x2"
Medium Scale: Sheet: 18"x29", Design: 15"x25"; each scale is approx. 4"x4"
Large Scale: Sheet: 20"x29.5", Design: 16.5"x25.5"; each scale is approx. 6"x6"
Fishscale tile patterns are back in style! This beautiful Moroccan inspired scallop tile stencil looks stunning on an accent wall, on a painted backsplash or as a tile floor. The dramatic mirror effect of this Mirror Fishscale Stencil pattern makes it a real show-stopper. Our tile stencils are the perfect money saving alternative to real scallop tiles. This mermaid tile pattern looks great on a bathroom wall, or as a trendy painted tile floor. 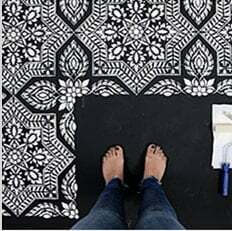 Learn How to stencil a tile floor - it’s so easy!